The first time you hold the COOLPIX B700, you'll know it's an exceptional camera. Its DSLR-style design, including a PSAM mode dial, puts key controls where you want them and feels great in your hands. The first time you zoom in with it, you'll wonder if any shot will ever be out of reach again. Subjects barely visible to the naked eye come into tight focus, held steady by cutting-edge Vibration Reduction technology. Use that power to capture stunning 20.2 megapixel RAW images, 4K Ultra High Definition (UHD) videos with stereo sound or 5 FPS high-speed sequences in nearly any light. Plus, the whole time you're shooting, the COOLPIX B700 can be connected to a compatible smartphone through Bluetooth® Low Energy (BLE) technology for instant photo sharing and remote camera control. This is more than a compact camera—it's a creative powerhouse. Few shots are too far away for the COOLPIX B700's NIKKOR Super ED glass lens. 60x optical zoom gives you super telephoto power, then Dynamic Fine Zoom, an enhanced digital zoom, effectively doubles that reach for a whopping 120x zoom. Dual Detect Vibration Reduction (VR) counteracts camera shake to keep your shots steady, and a 20-megapixel backside illuminated CMOS sensor captures every detail, even in low light. Install Nikon's new SnapBridge app on a compatible smartphone or tablet* and unlock exciting new capabilities with the COOLPIX B700. Built-in Wi-Fi®, NFC and Bluetooth® low energy (BLE) maintain a constant connection between the app and your camera, so each shot you take automatically transfers to your smartphone or tablet for sharing, editing with photo apps or uploading to your favorite sites. You can even use the SnapBridge app to control your camera remotely! 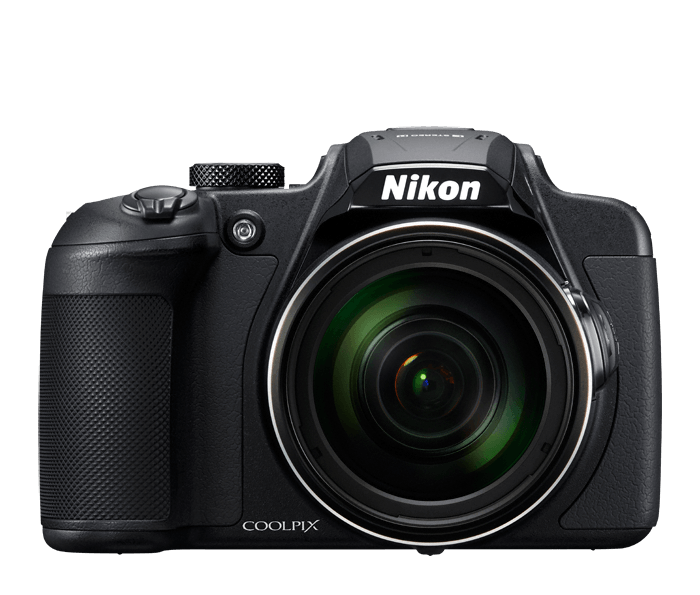 The COOLPIX B700 is a serious movie-making tool. Create with the awe-inspiring resolution of 4K Ultra HD (3840x2160) and selectable 30p or 25p frame rates. Face-priority AF keeps focus where you want it, and 5-Axis Hybrid Vibration Reduction (VR) keeps videos tripod-steady. High fidelity audio is captured with a stereo zoom mic that changes directivity according to zoom operation. Record up to 8 minutes with the touch of a button, then quickly delete unwanted footage right in the camera. Save still images while recording or during playback, connect to an HDTV with an optional HDMI cable, set autofocus to operate only when a subject moves and much more. For those who want to preserve maximum image quality and have greater flexibility for editing images outside of the camera, the COOLPIX B700 supports RAW (NRW) image capture. Capturing in RAW format preserves all of the data captured by the image sensor, making it easier to adjust exposure settings, white balance, colors and other settings using photo editing software. The COOLPIX B700's large, LCD display makes it easy to compose your shots or monitor your video recording. Reviewing and sharing your creations is a pleasure, too—every shot looks fantastic on the display. When you want to take control of exposure, the COOLPIX B700 is ready. Select from P/S/A/M exposure modes and the creative options will seem endless. The COOLPIX B700 is powered by an included EN-EL23 battery that charges quickly and delivers up to 420 shots per charge. Buy a second battery, and you can always have a fully charged back-up in your bag. When the action speeds up, simply hold the shutter button and fire off up to 5 continuous shots per second. Catch views you may not have seen before in your photos.